Lillie was once a part of the huge English-owned Rocking Chair Ranch. 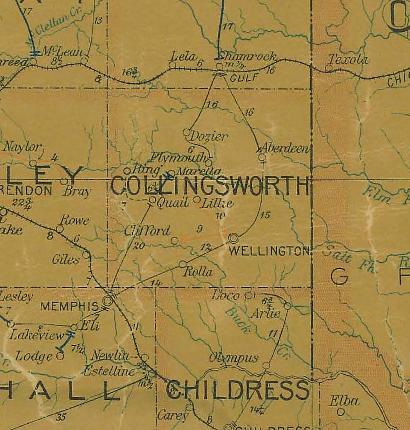 Organized as one of Collingsworth county�s school districts around the turn of the century, the village was granted a post office in 1905 which remained in operation only until the Spring of 1910. Lillie was a stop on the Ft. Worth and Denver City railroad, but that didn�t count for much economically. Lillie did appear on early maps but has since been erased from most. The name Lillie lives on in the name of nearby church (on FM 2344).